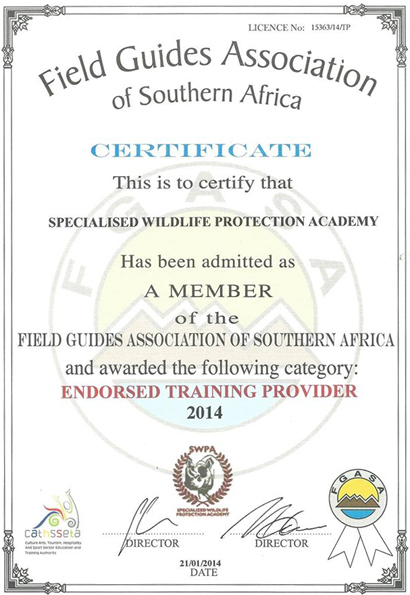 Firstly, to ensure the territorial integrity of protected areas by a high standard of specialized training. Secondly, to prevent the poaching of all species especially endangered species. And lastly, to collect evidence which may assist the police when making the arrests and when perpetrators are prosecuted in a court of law. The responsiblity of the Counter Poaching Game Ranger is to collect all evidence that may lead to the arrest of a poacher and is highly trained to deal with any situation. Evidence is collected in the form of photographs and video material, connecting the poacher to a specific crime scene or conservation area where poaching had taken place. A Counter Poaching Game Ranger must have the ability to follow and protect endangered species in a high risk Park or Game farm, such as Black Rhino, to prevent poaching of such endangered species without disturbance to the animal or compromising his presence to poachers. By training the Counter Poaching Game Ranger in small team operations, survival, tracking and a very high standard of Busch craft, will enable him to do his duty in any Conservation area all over the world. 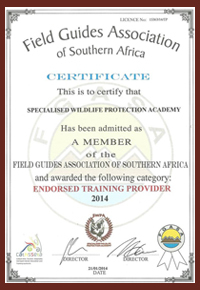 PLEASE NOTE: Only courses registered and paid directly with SWPA (Specialized Wildlife Protection Academy), will be aknowledged and carry the FGASA endorsement (Specials Skills Course). Specialized security work on Quotation. Click on one of the images below for more information on our various courses.